The VE278H is another good example of high quality gaming technology from ASUS. 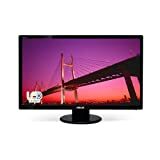 The large 27 inch display and multiple HDMI input options make this monitor a prime candidate if you’re looking for a central display piece to round out your gaming setup. Most Asus monitors boast the same simple, handsome, and practical housing – the VE278H is no exception. You’ll find the panel framed in glossy black plastic, and seated atop a standard “wedge” style stand, also in glossy black. There’s a series of 7 physical buttons alongside the bottom right side of the bezel, which offer a standard range of functions – menu, volume, brightness, power, position, and so on. The plastic trim looks fantastic, although it does tend to readily collect fingerprints and dust. The stand itself is one of my favorite parts of this monitors. It affords you granular control over the height, swivel, and tilt of the monitor, which many other models in this price range seem to lack. The height adjustment option alone is a huge positive for the VE278H, and can make a big difference in how much you enjoy using a monitor. This particular unit does have two built-in 3 Watt stereo speakers, which have surprisingly acceptable sound quality and performance. Overall, the casing is well-constructed and sturdy, and the monitor itself has a refreshingly slim profile. It won’t take up very much space on your desk at all. The VE278H is a 27-inch monitor, pushing a Full HD 1920×1080 resolution with a standard 16:9 widescreen aspect ratio. It has a maximum measured brightness of 300 nits, which is more than enough for any user out there. The unit does offer 2 HDMI inputs along with a standard VGA input, which is great news for anyone hoping to use this monitor as their primary display for PC and console gaming alike. One of the physical buttons is an input button, which allows you to easily switch between inputs. From a physical standpoint, the VE278H (including the stand) measures 25.3 x 8.66 x 17.54 inches, and weighs 13.2 pounds. This is a bit heavier than your typical gaming monitor, but that’s because of the extra screen real estate you get with a 27 inch display. The ASUS VE278H uses TN panel technology, operating at a 50,000,000:1 dynamic contrast ratio. TN panels might get a bad rap here and there, but ASUS did an excellent job in mimicking the advantages of an IPS panel with this VE278H TN panel (more below). One look at the specs of this monitor and you can tell it was made with gamers in mind – the VE278H brings a 60Hz refresh rate, 2ms response time, and negligible input lag to the table. The standard 60Hz refresh rate might be a bit of a letdown (especially compared to newer 144Hz monitors), but it’s nothing to get hung up on when you take the 2ms response time, minimal input lag, and affordable price point into account as well. Armchair Empire’s note on panel types: There’s a lot of misinformation out there on the various panel technologies utilized by gaming monitors, so we like setting the record straight. TN panels are one of three common panel types – TN, IPS, and VA – and are typically known for better refresh rates, response times, and input lag times, but slightly worse color reproduction and viewing angles. This makes them an excellent choice for competitive gaming, while IPS panels may be a better option for things like design work. All of that being said, panel technologies has vastly improved over the years and there are now minimal differences between high-end TN and IPS panels (viewing angle remains one area where IPS panels will always have an advantage). This monitor delivers the top-notch performance that ASUS is known for. However, you do need to spend a few minutes calibrating to your preferences when you first set the VE278H up. This is standard of TN panels, and nothing to worry about. After I adjusted the brightness, saturation, contrast, etc to levels that worked for me, I absolutely fell in love with the picture of this ASUS. I had no issues with color reproduction, although the viewing angles were lacking a bit – again, what you expect from any TN panel out there. I tested this monitor out with several competitive FPS games like Overwatch, and I’m pleased to say the super-fast 2ms response time resulted in absolutely no ghosting or motion blur during gameplay. Any pro FPS players out there will tell you how important this is when in the heat of battle – the last thing you want is motion blur or smudging throwing off your headshots. The 60hz refresh rate, again, isn’t the best out there – in fact, it’s completely standard. There’s nothing wrong with a 60hz refresh rate, although you will likely notice some screen tearing here and there. Screen tearing doesn’t affect gameplay, and I’m personally not particularly bothered by it. You won’t really notice it when you’re engrossed in a great game anyway (at least in my experience – I know other gamers can be pickier when it comes to screen tearing). The ASUS VE278H comes with a few neat little extras that I haven’t really seen on other monitors in this price bracket. Splendid Video Intelligence – This is an ASUS-specific technology that “enhances color, brightness, contrast, and sharpness” in order to optimize your media consumption. It comes with 6 preset video modes – Scenery, Theater, Game, Night View, sRGB, and Standard – and you can try these out using the physical menu button on the monitor. I found Scenery and Game mode to be particularly well-done, especially because I find many presets to be lackluster right out of the box. QuickFit Virtual Scale – This is a particularly handy technology for any designers out there. It basically lets you overlay different sized alignment grids on top of whatever window you have open, which is great for fine-tuning designs. VESA compatible – This monitor is VESA compatible, meaning it’s ready to be wall-mounted right out of the box. Last but not least, the monitor is made with eco-friendly, mercury-free materials. Its packaging is made with 80% recycled materials as well, which is great news for the environment. The ASUS VE278H is honestly a great choice for just about any user out there. It’s definitely slated more towards gamers, with its TN panel type, low response time, and multiple inputs, but it should suit designers, coders, and general PC users just fine as well. If you’re a hard-core designer in need of perfect color reproduction and sweeping viewing angles, you may want to look elsewhere (specifically at IPS panels). If a 24-inch monitor just isn’t quite doing it for you, check out this awesome 27-inch powerhouse from ASUS. It’ll meet all of your gaming needs and then some, and is fully capable of serving as the centerpiece to your entire gaming setup thanks to its multiple HDMI inputs and easy-switch input button. The speakers and included ASUS technologies are a nice touch that push this monitor from being just another mid-range monitor to more of a “must-have” – yet still affordable – gaming centerpiece.